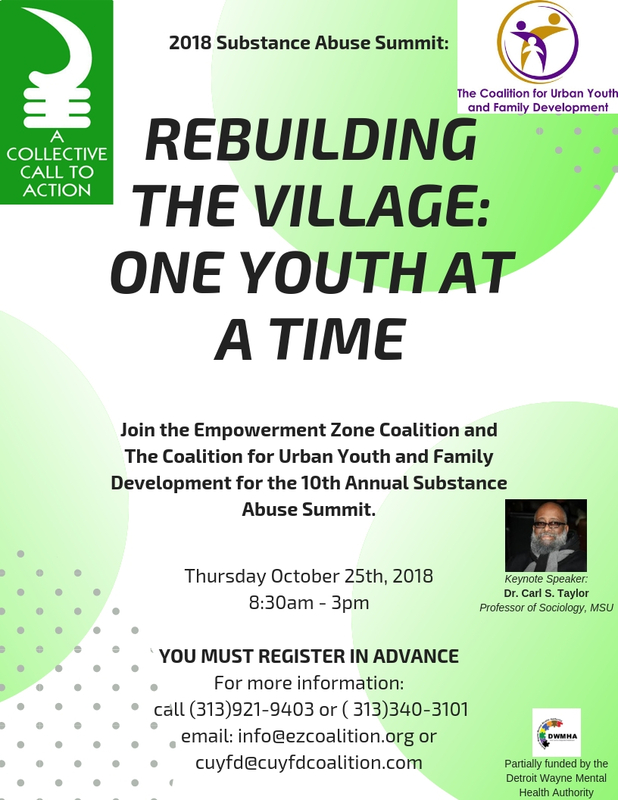 The Empowerment Zone Coalition (EZC) and The Coalition for Urban Youth and Family Development invites you to the "Collective Call to Action" 2018 Substance Abuse Summit. This year's primary focus is to explore drugs and drug-related issues that impact youth. We will discuss and formulate solutions that may be used across all sectors of the community. The Summit will challenge those in attendance to embrace a multiple-strategy approach and utilize information to become actively involved in changing social norms to create drug-free, healthy and safe communities. The Summit also will include dynamite keynote speaker, guest speakers, breakout workshops, continental breakfast, lunch, pending continuing education units (CEUs). A special contribution from The Center for Urban Youth and Family Development will include a presentation by our program director Marseille Arbuckle, Jr. discussing Suicide and Substance Abuse. Join us for this exciting event! Together, we can make a difference.